PAIR Galvanised door top for S. SECOND ROW DOORS + PARTS. SP 4x4 LTD was founded in 2011, filling the gap in the market for quality Land rover body panels but at the lowest prices around. We send out about 50 panels a day supplying the world market as well as our own. Pair of Galvanised front door tops (LH+RH). These dont have the square hole in them which is the correct series 2 spec. (series 3 models have a square hole for the latch). The frame is hot dip galvanised giving it a thick coat of zinc on both the outside & inside. The Aluminium skin is marine bonded to the frame to give it a really good fit & avoid any corrosion with the Aluminium in the future. The skin is also painted before it is fitted to the frame as extra protection. The skin will arrive bare but sanded ready for primer. These are the best door tops on the market and are made in the UK and will last a very long time! All larger items such as bodypanels etc will be delivered by Interlink or APC which is a next day courier service, however due to the fragility of some of these items please appreciate we may take a day or so to package these items correctly to minimise the chance of damages. 3 In the unlikely event that a wrong item is received, please return the item to us within 7 days of receipt and we will send the correct item free of charge and all return costs will be covered. 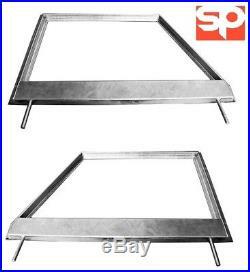 The item "Pair Galvanised Door tops For Land Rover Series 2/2a Models 1958-71 Unglazed" is in sale since Monday, October 9, 2017. This item is in the category "Vehicle Parts & Accessories\Car Parts\Exterior & Body Parts\Doors & Door Parts". The seller is "spglobalparts" and is located in liverpool, Merseyside. This item can be shipped worldwide.